The ocean world of Charybdion seethes with discontent and a growing sense of danger. Charybdion’s planetary governor has gone missing, and his councilors struggle to select a suitable heir. Meanwhile, mysterious murders, nightmares, and other dangers threaten to cast this planet into anarchy and despair. 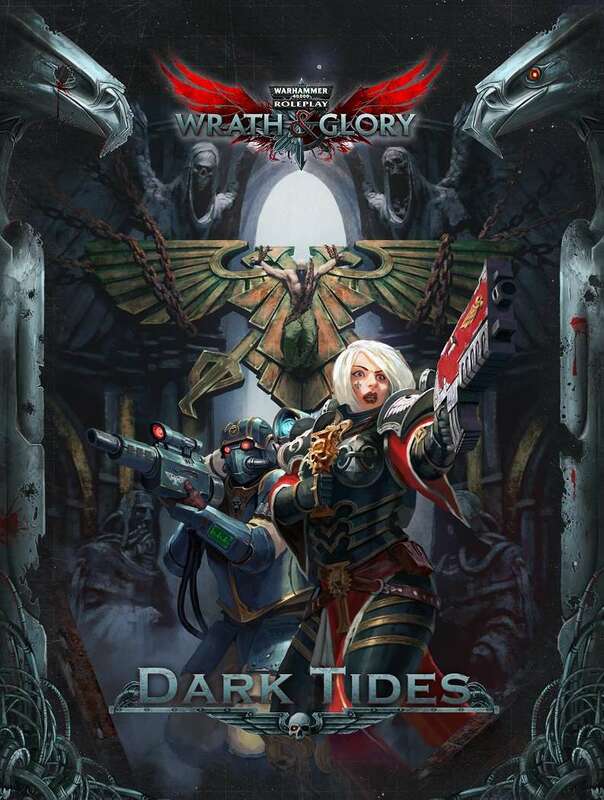 Dark Tides is an anthology of five linked adventures that bring your heroes face-to-face with the dangerous villains responsible for Charybdion’s troubles. Can your heroes confront the vile forces spreading insanity and corruption? The fate of this planet is in yourcharacters’ hands—if they can survive what lurks beneath the dark tides. From the palace of the planetary governor to the seedy underhive, from streets plagued with horrific dreams to the depths of a terror-filled Enforcer facility, these adventures test the limits of your characters’ abilities. While these adventures are linked together in an overall narrative, there is advice for each one to be run as a standalone module instead, should you prefer.